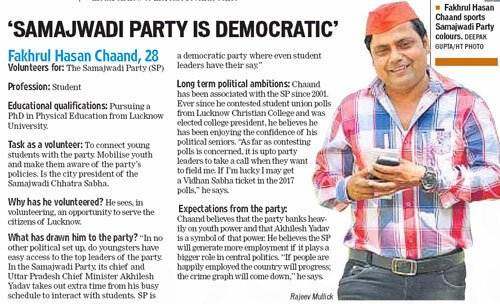 Was reading the paper today and came across a page where some volunteers of political parties were interviewed, their thoughts on the party and their ambition. The one below got my attention and i must say that Samajwadi party have volunteers which are geniuses in academics at the least.. why do i say that? Allow me to present the evidence. Age of the volunteer as mentioned 28. 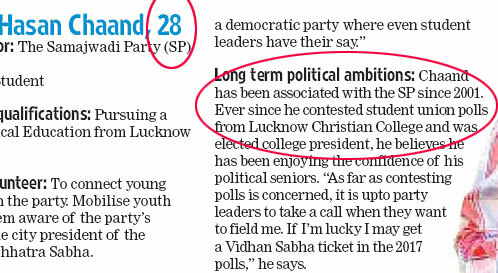 His association with SP from 2001 ever since he won the students union elections to be come the president. Since the 2001 elections where 13 years back, this would make the Volunteer 15 years of age.. WOW!! He must have been the youngest candidate ever to win a college elections! This entry was posted on Sunday, March 16th, 2014 at 9:11 am	and is filed under Uncategorized. You can follow any responses to this entry through the RSS 2.0 feed. Both comments and pings are currently closed.